Elon Musk is perhaps this century’s most enigmatic figure. For two decades, he’s been unstoppable, uprooting more industries — energy, transportation, payments, space — than any one person could reasonably expect in a lifetime. For a while, Elon Musk seemed like our greatest hope. He claimed his sole aim was to fight off humanity’s greatest existential threats. We were enamoured by his optimism, and his grandiose visions of the future. But something has changed. If you look at today’s headlines about Elon Musk, you won’t find stories about his heroics. Instead you find the picture of a frantic man falling short of his promises to shareholders, lashing out at critics on Twitter. The same news outlets that worshippedhim are now dragging his name through the dirt. Rather than relying on anecdotal evidence, we’re going to quantify this change in sentiment. Reddit is often considered a trend-setter on the internet, so we’ll start there. 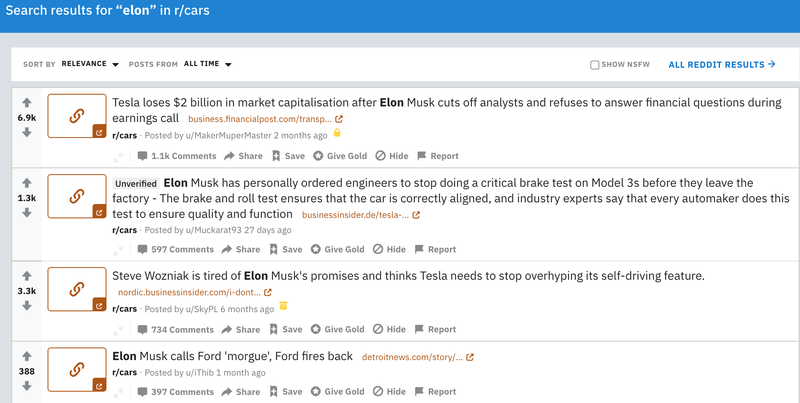 I’ve pulled over 250,000 comments mentioning Elon Musk from January 1, 2015 to July 27, 2018. Here is the number of comments plotted over time. Following a peak in February, we are coming off the precipice of another period of Musk-mania. 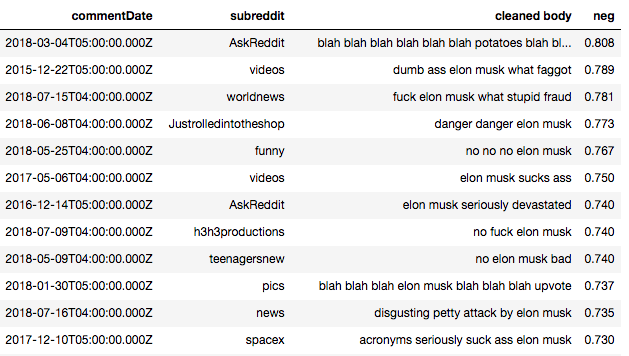 Here are the 25 subreddits with the most mentions of Elon. 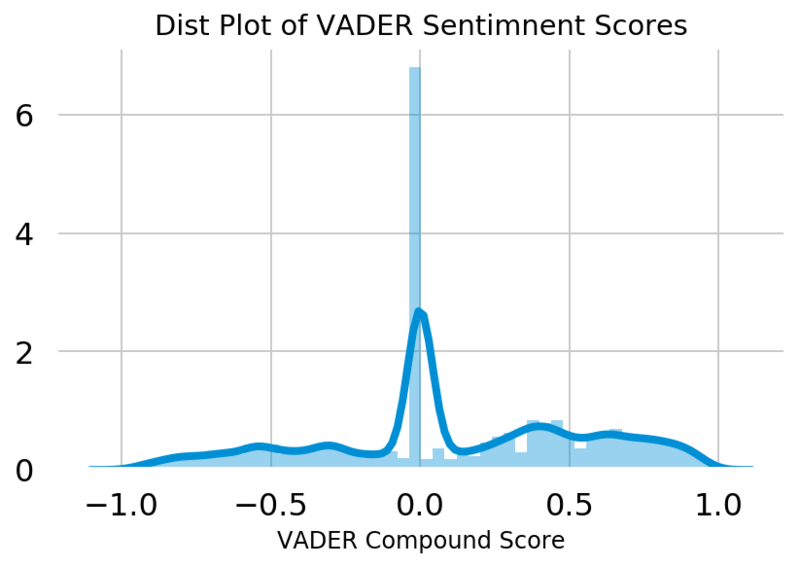 Looking at the # of comments is all fine and dandy, but our real mission is to understand sentiment. To do so, we’re going to enlist the help of a powerful python library called VADER (Valence Aware Dictionary and sEntiment Reasoner). VADER was specifically designed to help analyze social media text. You can read more from the paper here. You can think of VADER as a giant dictionary of sentiment. It looks up a phrase and spits out a sentiment score between -1 and +1. The sentiment behind every word is calculated by averaging a large number of human impressions. Enough talk. Let’s run our comments through VADER to see what we get. We can see from the big peak in the middle that most of the comments have a neutral score. There also seems to be slightly more area under the right hand side of the plot where sentiment is positive. Just to gut-check, let’s look at some of the most negative comments. There are two ways we can compute average sentiment. The first way is to simply calculate the average sentiment score across every single comment. At a glance, this chart makes a lot of sense. The top subreddit by average sentiment is /r/IAMA. Elon Musk did a AMA that was extremely well received in 2015. It got 67k upvotes and over 11k comments. 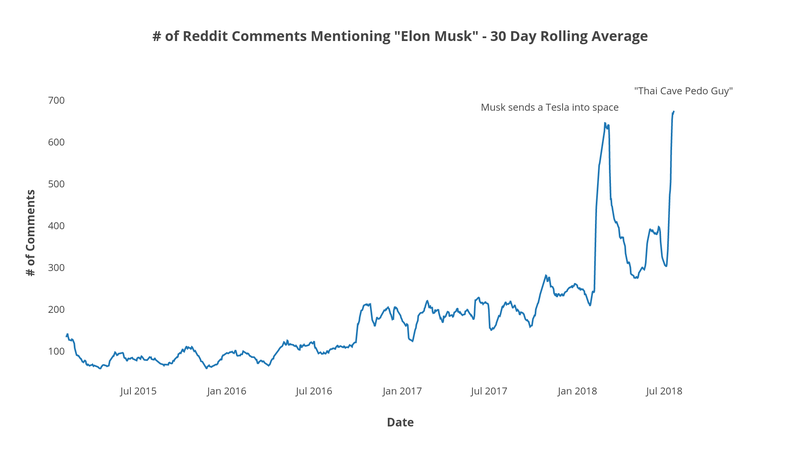 We would also expect higher average sentiment in subreddits that are named after his companies: SpaceX, Teslamotors, and SpaceXLounge. Beyond that, he is also highly praised in subreddits like /r/space and /r/futurology. The second way we can calculate average sentiment is by calculating the weighted average based on comment score. We’ll take the score from a comment, and divide it by the total sum of comment scores from that subreddit. 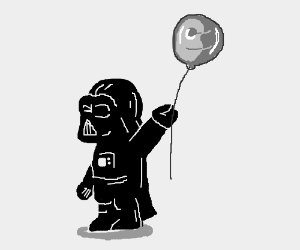 Then we’ll multiply the result with our VADER score. A comment with 10 points for example, will be weighed 10x as much as a comment with 1 point. Comments with negative score will be weighted in the opposite direction. A negative comment with negative score will end up being treated like a positive comment. The weighted average score gives us slightly different results. Unlike the first method, some subreddits actually have negative average sentiment. It’s possible this is the case because people are more comfortable anonymously upvoting negative comments than writing mean comments themselves. 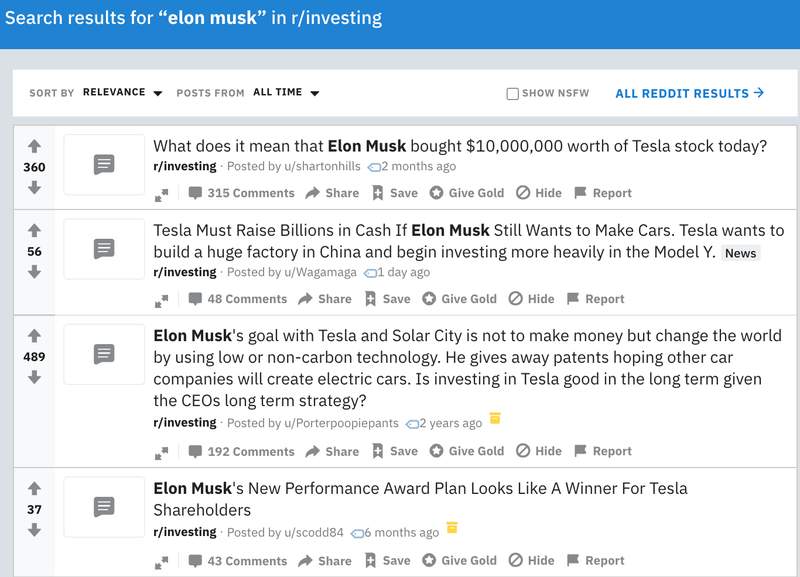 Surprisingly /r/cars out-edges /r/wallstreetbets as the subreddit that is the most negative towards Elon. 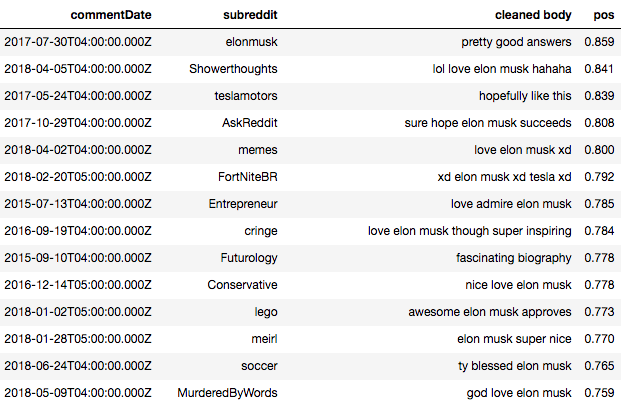 According to our data, /r/investing is generally positive about Elon. We can gut-check this by searching for the top posts mentioning him. But man oh man, /r/wallstreetbets does not like Elon. 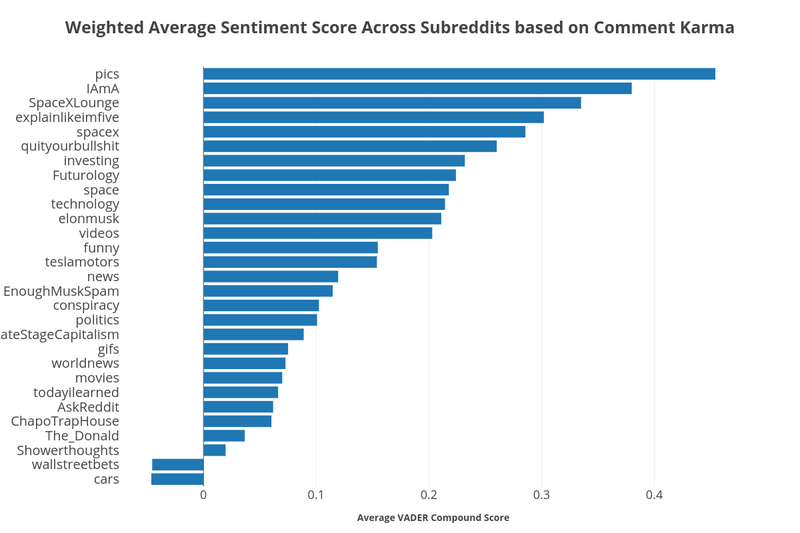 We can see that it ranks among the lowest subreddits by average sentiment score. The consensus in the subreddit is that Elon is a poor businessman, who is consistently falling short of his promises. I found these two posts scrolling through the front page of /r/wallstreetbets today. 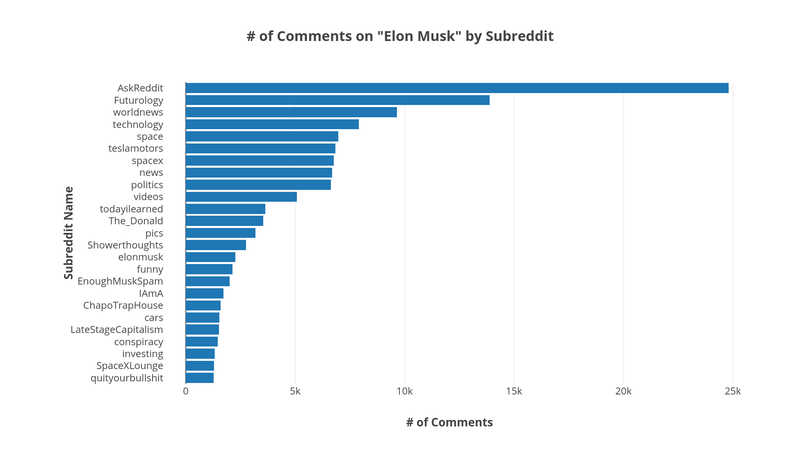 Another funny observation is that the two subreddits known for their alternative political stances, /r/the_donald for the alt-right and /r/chapotraphouse for the alt-left, both dislike Elon. 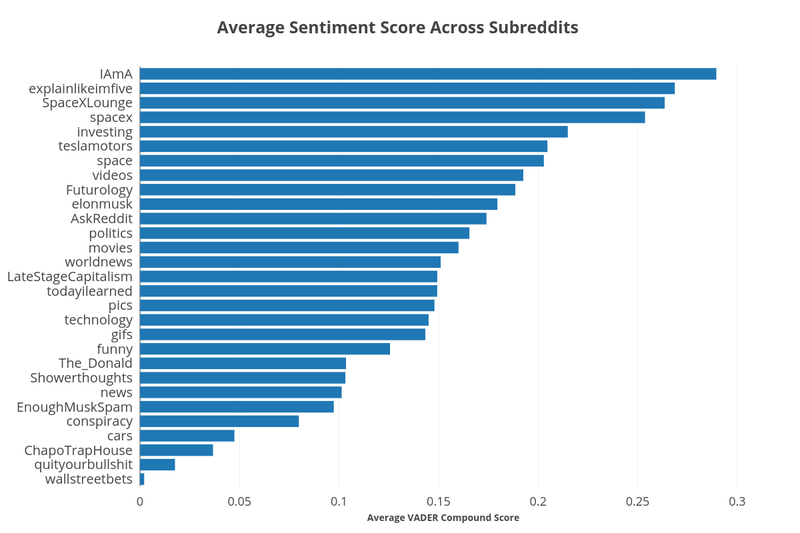 In our data, they rank as two of the lowest subreddits by average sentiment score. Chapo Trap House is a podcast that is closely identified with the “Dirtbag Left”. Finally they’ve found something to agree on? Looking at the average sentiment across subreddits doesn’t show us how sentiment changes over time. We’ll need to visualize the data as a time series for that. Over the last 3 and a half years, there’s been a slow decline in sentiment. 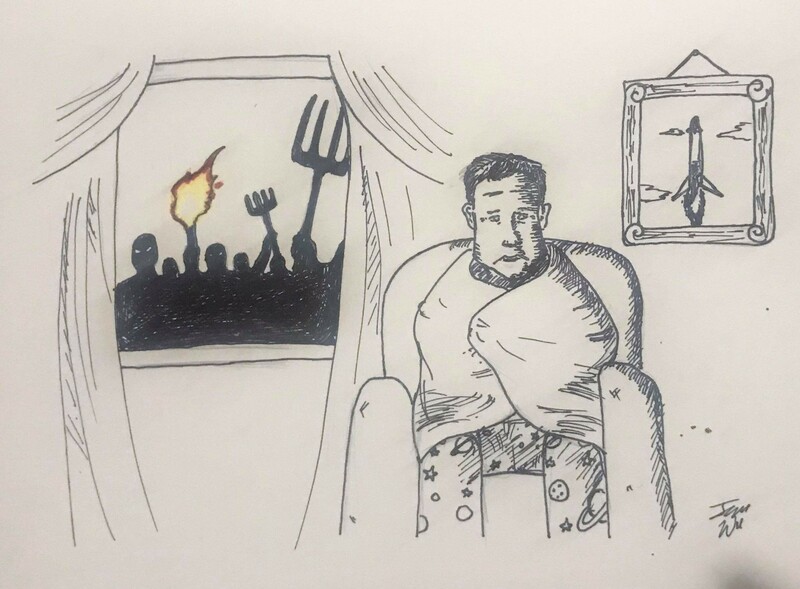 The last 3 months have been among the worst. Only time will tell if this trend will continue. 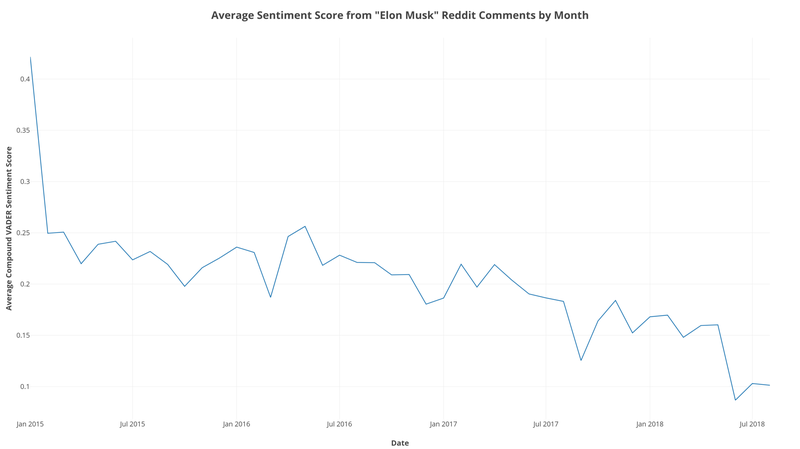 If you’re interested in visualizing this shift in sentiment across the 25 subreddits with the most Elon Musk mentions, you can check oout the interactive plot below. The plot is hard to read with too many subreddits. Click the legend to show or hide each subreddit. The subreddits that have experience the largest downturn in sentiment are /r/cars, /r/wallstreetbets, /r/investing/, and /r/politics. The internet changes its mind about a lot of people. It’s not surprising that Elon Musk is one of them. Perhaps Musk’s descent into infamy is self-inflicted. For too long, he has over-promised and under-delivered and now his critics have come home to roost. Or maybe we are treating Musk like we treat every celebrity. The combination of our obsession for news and drama and the echo-chamber of social media groups turns every tidbit of controversy into an avalanche. Whatever the reason, the tides are changing. The raw data we get back from Pushshift API is mostly good but not perfect. We’ll need to clean it up before we start our sentiment analysis.